If you’re looking for pet ID tags for your cat or dog that are high quality, then you’re in the right place. Our pet tags are made from a variety of the highest quality materials and are available in a multitude of shapes, sizes and styles. If your tag breaks we guarantee to replace it. However we do not replace lost tags, so if you notice any wear and tear which could lead to the tag breaking, return it immediately for a replacement. No need to worry about attaching your pet tag to collar’s either, because ours are supplied with a strong split ring that will keep it safe and sound. For even more ease and convenience, you can purchase an eZeClip for the collar, too. All our ID tags are high quality metal and engraved using our state of the art laser engravers, so we promise to replace the tag if it fades or breaks. It is recommended that your pet only wears one pet tag at a time, however, to ensure wear and tear is kept to a minimum. We would also suggest that you purchase a stainless steel tag for your dog if they swim regularly. Please note: Bling tags are not recommended for swimming, and should only be worn for special occasions and downtime. Keep in mind that solid brass will always tarnish eventually so just give your brass tag a polish from time to time to look their shiny best. If your tag fades or breaks, simply email us with a photo and we will replace it! Engraving can be done on all of our pet tags. It is recommended that you keep text and details as succinct as possible for legibility. Don’t be tempted to add spaces, unnecessary punctuation or fancy symbols. These will only make the engraving smaller and harder to read. We reserve the right to change text layout on your tag to ensure it fits comfortably. Note: The Control of Dogs Order 1992 specifies that identification details should include the owner's name and address. House number/name and postcode is acceptible to most council dog wardens, but check with your local dog warden if you are not sure. Dog wardens do request that at least one phone number is engraved for speedy return of your dog. Some Kennel Club trainers will require the first line of the address and postcode. The Kennel Club recommends not including the dog's name on the tag. 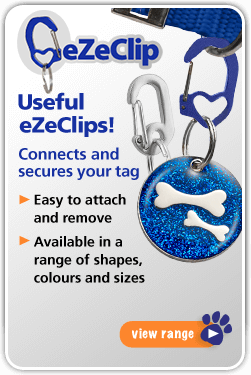 Attaching and reattaching your new pet tag has never been easier than with an eZeClip. The strong and sturdy metal clasp secures your tag to your pet’s collar with ease. Simply attach your tag to the split ring and then attach the split ring through the hole in the eZeClip and clip onto the collar. Should your eZeClip not attach securely or appears to be faulty, please return to us for an immediate exchange. The small size eZeClip is suitable for small-medium sized pets. The large size eZeClip is suitable for medium-large sized pets. The eZeClip may not be suitable for very small pets if it causes the tag to hang too low. Pets should be supervised when wearing pet tags and collars, and these should always be removed if your pet is left in a crate or car cage, to avoid the risk of injury. We supply a small range of quality genuine leather or cow hide dog collars that you can match up with our tags in a bundle, giving you a free eZeClip valued at £4.95. Choose from our popular up-market Suede Bling, plain coloured Leather or Round Rivet Leather collars. 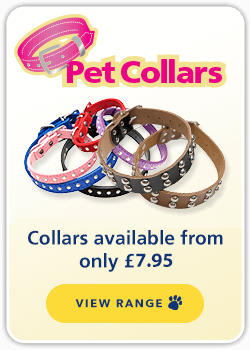 We are currently sourcing quality cat collars to add to our pet collars range. 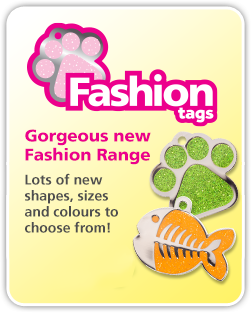 Our exciting fashion tag range is fun, stylish and available in a wide variety of fun and cute designs. Tags are made using strong metal finished in nickel, and for added peace of mind, images are epoxy-coated for protection against fading. Our designer tags are made using a metal alloy finished in nickel and are available in a range of colourful designs; flowers, love hearts, bones and paw prints are all the rage. All of our tags are epoxy coated to protect against peeling and are available in three sizes. Unfortunately, the ‘Meow’ design is only available in one size. For the pet that deserves a bit of glam – our stunning pet tags are set with Swarovski crystals in a range of colours and are available in a range of styles and designs to suit; perfect for your hip and trendy pets. These sparkling Bling pet tags are made using a strong metal alloy and have a silver or gold finish. Our most durable pet tag is stainless steel – perfect for active cats and dogs that like to get wet and muddy on their adventures. Available in a range of sizes and designs, there is a tag to suit all pets. If your pet prefers to stay inside in the warmth, then our brass tags are ideal and are also available in a number of designs. This range of tags is made from anodized aluminium ensuring they are strong but lightweight on your pet’s collar. Choose from a selection of designs including hearts, bones, cat faces and more. You can choose what information you would like to be engraved on your dog's ID tag. The Control of Dogs Order 1992 specifies that dog identification details should include the owner's name and address - house number/name and postcode will suffice. However, if your dog is involved in any Kennel Club training and awards programs, the full address is required. A phone number is optional, but recommended. The Kennel Club recommends NOT including the dog's name on the tag, however we will engrave whatever information you request. The more information you request on each line, the smaller the text will be on the line. Please note: Pet tags with images can only be engraved on the back. Keep engraved text as short as possible, or the font size will decrease.